Fortified wine is a wine to which a distilled spirit, usually brandy, is added. Many different styles of fortified wine have been developed, including Port, Sherry, Madeira, Marsala, Commandaria wine, and the aromatised wine Vermouth. One reason for fortifying wine was to preserve it, since ethanol is a natural antiseptic. Even though other preservation methods now exist, fortification continues to be used because the process can add distinct flavors to the finished product. Although grape brandy is most commonly added to produce fortified wines, the additional alcohol may also be neutral spirit that has been made from grapes, grain, sugar beets or sugarcane. Regional appellation laws may dictate the types of spirit that are permitted for fortification. For example, in the U.S. only spirits from fruit may be used. The source of the additional alcohol and the method of its distillation can affect the flavour of the fortified wine. If neutral spirit is used, it will usually have been produced with a continuous still, rather than a pot still. Madeira is a fortified wine made in the Madeira Islands. The wine is produced in a variety of styles ranging from dry wines which can be consumed on their own as an aperitif, to sweet wines more usually consumed with dessert. Madeira is deliberately heated and oxidised as part of its maturation process, resulting in distinctive flavours and an unusually long lifespan once a bottle is opened. Mistelle (Italian: mistella; French: mistelle; Spanish, Portuguese, Galician and Catalan: mistela, from Latin mixtella/mixtvm "mix") is sometimes used as an ingredient in fortified wines, particularly Vermouth, Marsala and Sherry, though it is used mainly as a base for apéritifs such as the French Pineau des Charentes. It is produced by adding alcohol to non-fermented or partially fermented grape juice (or apple juice to make pommeau). The addition of alcohol stops the fermentation and, as a consequence Mistelle is sweeter than fully fermented grape juice in which the sugars turn to alcohol. Moscatel de Setúbal is a Portuguese wine produced around the Setúbal Municipality on the Península de Setúbal. The wine is made primarily from the Muscat of Alexandria grape and typically fortified with aguardente. The style was believed to have been invented by José Maria da Fonseca, the founder of the oldest table wine company in Portugal dating back to 1834. Sherry is a fortified wine made from white grapes that are grown near the town of Jerez, Spain. 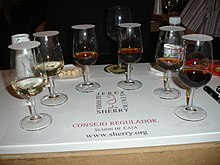 The word "sherry" itself is an anglicisation of Jerez. In earlier times, sherry was known as sack (from the Spanish saca, meaning "a removal from the solera"). In the European Union "sherry" is a protected designation of origin; therefore, all wine labelled as "sherry" must legally come from the Sherry Triangle, which is an area in the province of Cádiz between Jerez de la Frontera, Sanlúcar de Barrameda and El Puerto de Santa María. Sherry is produced in a variety of styles, ranging from dry, light versions such as finos to much darker and sometimes sweeter versions known as olorosos. Cream sherry is always sweet. Vermouth is a fortified wine flavoured with aromatic herbs and spices ("aromatised" in the trade) using closely guarded recipes (trade secrets). Some of the herbs and spices used may include cardamom, cinnamon, marjoram and chamomile. Some vermouth is sweetened; however, unsweetened or dry, vermouth tends to be bitter. The person credited with the second vermouth recipe, Antonio Benedetto Carpano from Turin, Italy, chose to name his concoction "vermouth" in 1786 because he was inspired by a German wine flavoured with wormwood, an herb most famously used in distilling absinthe. However, wine flavoured with wormwood goes back to ancient Rome. The modern German word Wermut (Wermuth in the spelling of Carpano's time) means both wormwood and vermouth. The herbs were originally used to mask raw flavours of cheaper wines, imparting a slightly medicinal "tonic" flavor. As the name suggests, Muscat de Beaumes-de-Venise, Muscat de Rivesaltes and Muscat de Frontignan are all made from the white Muscat grape, whilst Banyuls and Maury are made from red Grenache. Regardless of the grape, fermentation is stopped by the addition of up to 10% of a 190 proof (95%) grape spirit. The Grenache vins doux naturels can be made in an oxidised or unoxidised style whereas the Muscat wines are protected from oxidation to retain their freshness. These wines continue to be associated with the homeless, mainly because marketers have been aggressive in targeting low-income communities as ideal consumers of these beverages; organisations in cities such as Los Angeles, San Francisco, Seattle and Portland have urged makers of inexpensive fortified wine, including E & J Gallo Winery, to stop providing such products to liquor stores in impoverished areas. In 2005, the Seattle City Council asked the Washington State Liquor Control Board to prohibit the sale of certain alcohol products in an impoverished "Alcohol Impact Area." Among the products sought to be banned were over two dozen beers, and six fortified wines: Cisco, Gino's Premium Blend, MD 20/20, Night Train, Thunderbird, and Wild Irish Rose. The Liquor Control Board approved these restrictions on August 30, 2006. Gwaha-ju is a fortified rice wine made in Korea. Although rice wine is not made from grapes, it has a similar alcohol content to grape wine, and the addition of the distilled spirit, soju, and other ingredients like ginseng, jujubes, ginger, etc., to the rice wine, bears similarity to the above-mentioned fortified wines. 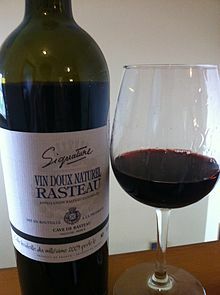 Under European Union legislation, a liqueur wine is a fortified wine that contains 15–22% abv, with Total Alcoholic Strength no less than 17.5%, and that meets many additional criteria. Exemptions are allowed for certain quality liqueur wines. 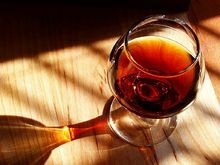 ^ "Types of Fortified Wines You Might Enjoy Before or After Dinner". The Spruce Eats. Retrieved 2018-12-23. ^ Antonello, Biancalana. "DiWineTaste Report: Tasting Fortified Wines". DiWineTaste. Retrieved 2018-12-23. ^ ‘Mistela’ Archived 2014-11-10 at the Wayback Machine in Oxford Companion to Wine, ed. by Jancis Robinson, 2nd ed. (Oxford: Oxford University Press, 1999), s.v. ^ "mistelle Definition in the Wine Dictionary at Epicurious.com". epicurious.com. Archived from the original on June 6, 2011. Retrieved 2009-04-05. ^ Biancalana, Antonello. "Production of Fortified Wines". DiWineTaste. Retrieved 2009-04-05. ^ Yu, Tae-jong. "Gwaha-ju". Encyclopedia of Korean Culture (in Korean). Academy of Korean Studies. Retrieved 12 March 2018. ^ Park, Rock Darm (12 April 2012). "Gwaha-ju". Naver (in Korean). Retrieved 12 March 2018. 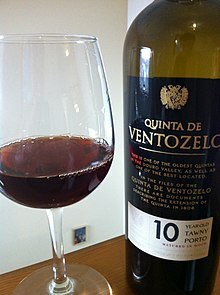 Look up fortified wine in Wiktionary, the free dictionary.